EchoSpan has integrated with Microsoft Cognitive Services to provide Sentiment Analysis* of comments in PDF reports. 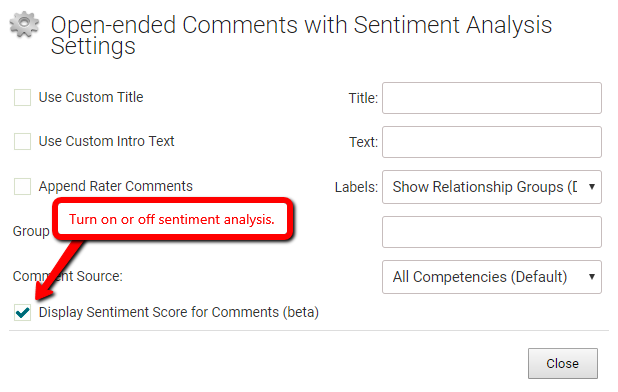 Sentiment scores are calculated once for each Target’s responses when a report is generated. Sentiment Analysis “reads” comments in reports and presents the reader with a measure of positivity for each one presented as a small graph above the comment text. Sentiment scores are useful in quickly identifying comments that may be highly positive or negative. *This feature will be released initially as a publicly available beta to Professional and Enterprise Edition customers while final testing is performed. Click the "Settings" option on the right side of the screen for the open-ended comments component. Here, you will find the option to turn on or off the sentiment analysis feature by checking or unchecking the box.